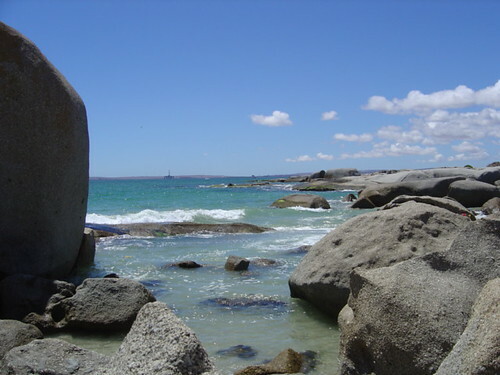 Scientists look inland for traces of the beaches of a warmer land by exploring rock formations in South Africa, seeking indications of how much the earth's oceans can rise. BREDASDORP, South Africa - A crew of scientists barreled down a dirt road in a two-car caravan. After searching all day for ancient beaches kilometers inland from the modern shoreline, they were about to give up. Suddenly, the lead car screeched to a halt. Paul J. Hearty, a geologist from North Carolina, leapt out and seized a white object on the side of the road: a fossilized seashell. He beamed. In minutes, the team had collected dozens more. Using satellite gear, they determined they were 11 kilometers inland and 19 meters above South Africa's modern coastline. For the leader of the team, Maureen E. Raymo of Columbia University in New York, the find was an important clue as she tries to determine how high the oceans might rise in a warmer world. The question has taken on new urgency after Hurricane Sandy, which caused coastal flooding in the United States that scientists say was almost certainly worsened by a rise of sea level over the past century. That kind of storm tide, the experts say, could become routine along coastlines by late in this century if the ocean rises as fast as they expect. When the earth warms by only a couple of degrees, enough polar ice melts, over time, to raise the global sea level by about 7.5 to 9 meters. But in the coming century, the earth is expected to warm four or five degrees, because of the rising level of carbon dioxide and other greenhouse gases. Experts say the greenhouse gas emissions that may make a huge increase of sea level inevitable are expected to occur in the next few decades. They fear that because the world's coasts are so densely settled, the rising oceans will lead to a humanitarian crisis lasting many hundreds of years. "I wish I could take people that question the significance of sea level rise out in the field with me," Dr. Raymo said. "Because you just walk them up 30 or 40 feet in elevation above today's sea level and show them a fossil beach, with shells the size of a fist eroding out, and they can look at it with their own eyes and say, 'Wow, you didn't just make that up.'" The fossil record indicates nothing quite like today's rapid release of greenhouse gases and its effect of raising the planet's temperature. "Absolutely, unequivocally, nature has changed before," said Richard B. Alley, a climate scientist at Pennsylvania State University. "But it looks like we're going to do something bigger and faster than nature ever has." Dr. Raymo is trying to find an era with temperatures that mirror those expected before 2100.She has closed in on the Pliocene epoch three million years ago. The carbon dioxide in the air then appears to have been about 400 parts per million - a level that will be reached again within the next few years, after two centuries of fossil fuel burning. Dr. Raymo and her team drove hundreds of kilometers along South Africa's southern and western coasts, scouting for prehistoric beaches. To collect ancient seashells for laboratory testing, they hiked treacherous paths and descended into old quarries and diamond mines. The team located suspected Pliocene beaches as low as 11 meters and as high as 33 meters above modern sea level. In similar work in Australia and on the East Coast of the United States, the researchers have found Pliocene beaches as low as 10 meters and as high as 88 meters above sea level. Part of the explanation for such varying elevations, Dr. Raymo said, is that the land itself has almost certainly moved over the last three million years, unevenly - thus raising or lowering beach deposits after they had been laid down. "A lot of the big task we have is teasing apart this dance that the crust of the earth is doing with the level of the sea," Dr. Raymo said. Her team plans to gather measurements from most continents. They hope to arrive at the magic number Dr. Raymo calls Pliomax, or the maximum global sea level rise during the Pliocene. The previous estimates of Pliocene sea level range from 4.5 meters to 39 meters above today's ocean. If Dr. Raymo's work were to confirm the higher estimates, it would suggest that the ice sheet in eastern Antarctica - the biggest chunk of ice in the world, containing enough water to raise sea level by 54 meters - is also vulnerable to melting. Scientists do not fully understand why. Thus the project may put an upper limit on how much the ocean is ultimately capable of rising if temperatures go up as much as expected this century. Recent research suggests the likely rise could be four meters by the year 2300, inundating coastal regions around the world. If the rise is slower than expected, society may have time to adjust. But many scientists fear their calculations will turn out to have been too conservative. "At every point, as our knowledge increases," Dr. Raymo said, "we've always discovered that the climate system is more sensitive than we thought it could be, not less."